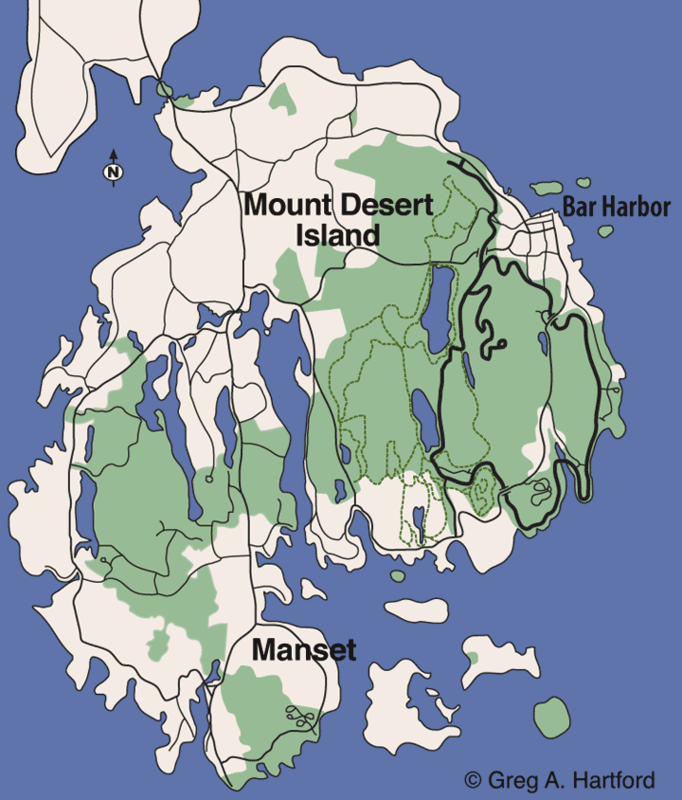 Manset, part of Southwest Harbor, Maine, is on the southwestern side of Mount Desert Island near the southern entrance to Somes Sound, the only Fjord on the east coast of the United States. It provides spectacular views of several mountains including Cadillac Mountain in Acadia National Park. This is a great base location for sailing north into Somes Sound and exploring the Cranberry Islands to the southeast. Manset is home to the famous yacht builder, Hinckley Company and there are other private companies renting sailboats and motorboats. Ferry service to the out islands is available in Southwest Harbor. Bear Island and the Bear Island Lighthouse, also seen from this location, is actually located in Northeast Harbor, Maine. The original light station was extablished in 1839. The current 31 foot high lighthouse (100 foot high focal plane) was constructed of brick in 1889. Service was discontinued in 1982 but it was relighted in 1989 as an automatic and private aid to navigation. The lighthouse is closed to the public and is best viewed by boat. There are numerous great photographic opportunities that become visible opnce you turn onto the Shore Road in Manset. The road hugs the shoreline as you are driving southeast. While traveling in this direction, the harbor, Somes Sound, cadillac Mountain, and many yachts are in plain sight on the left. The sun rises behind this scenery, and late in the eveing, lights up the mountaintops in a golden glow. The shores of Manset in Southwest Harbor on Mount Desert Island, Maine is for sure one of the special places that seems to be known only by longtime visitors and insiders like AcadiaMagic.com. Once you have discovered it, the location sticks in the mind and stays. With so many spectacular places along the Park Loop Road and elsewhere in Acadia National park, it may be easy to get settled into a certain routine. This is one of those locations that stretches the experience and options in a good and lasting way. Give it a try this time, or next time, but do it soon!